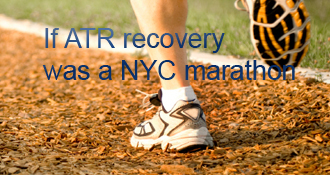 bamf has completed the grueling 26.2 ATR miles to full recovery! I got my boot today. My cast was removed. Foot horribly dry and stinky leg. My calf muscle is pretty much non existent. I am PWB on two crutches for several weeks…. My Dr. wants me to be FWB in 2 weeks. I should say PWB in a boot without crutches in 2 weeks. gave my leg and foot a good scrubbing and then a rub with vitamin E. It’s sore, but not too bad My swelling was really non-existent. My dr. was still not thrilled with the vaco boot. They wanted me to use something they were more familiar with. It seems comfortable, but we will see how well it works out. Glad the nerves healed up! Keep at it! I was initially around 20 degrees off each direction when I started PT, so I agree you are off to a good start! Hopefully they gave you a rubber band so you can do “homework” - doing those exercises at home helps alot. My dorsal is 10 degrees off each direction from my good foot. PT guru says that is a good start. I can do no wobbly stuff yet. I have been doing the bands and have good strength, but still have a lot of swelling and MAJOR internal scar tissue (size of a medium marble). I pretty much have hardly any balance and can hardly do a calf raise. I can’t wait to be 2 months into PT! How is your balance and dorsiflexion (upward movement)? At first I was doing rubber band therapy and standing on various wobbly things during PT and at home. It’ was only after two months or so of PT that I started working on the hard stuff (various forms of calf raises). Thanks for the comment! I feel the same way about stairs. I have been hopping up them but not down. I have to mae sure there is a hand rail and move real slow. Two shoes was a little scary for me at first because the boot was a cumbersome security blanket for me, but it didn’t take long before two shoes started feeling more natural. PT will help with the scar tissue / adhesions / mass of collagen. Going down stairs was actually more of a problem for me than going up - my limited range of motion meant turning diagonally or having both feet on one step before the next step down. Good luck, and enjoy getting back to more normal activities! I should probably note that I did at home PT exercises for several weeks before I started driving. I had no strength or pain issues braking. My boot was small enough to allow me to hit the gas without interfering with the brake. I have an automatic. I could not drive if I had a manual. I had to go back through my posts here to recall what numbness I had. I got numbness in my big toe because the cast was pressing on a nerve on the top of my foot. Your numbness may be due to a nerve that got tweaked when you fell. I think I had some numbness on the side of my foot (outside) and the doc said that was probably due to the nerves that get annoyed during surgery. Eventually all that numbness went away. The back of my heel still doesn’t feel quite the same as my non-surgery foot. Some sensation, but not as much so there may be nerves that were affected by the surgery and the heel may never feel quite the same. Admittedly I’ve gotten more sensation as time has passed but it still doesn’t feel quite the same as the non-surgery foot. I’ve been using castor oil for my dry face skin - you might try that instead of lotion. To me the moisture lasts longer with the castor oil compared to lotions. And I was also exercising 6 days a week before my surgery (soccer 3 days a week, high intensity interval training 1 day, orange theory 1 day, weight lifting one day. I actually exercises harder right before surgery since mine was planned and not due to a rupture. I finally got back to doing my pre-surgery exercises at about 8 months I think and even then some exercises reminded me my surgery foot still wasn’t as strong as it used to be. It takes a while to get back to pre-surgery fitness levels but I knew that going in. I’m just happy now that my right achilles doesn’t hurt all the time anymore! Before you do any exercises that stress your achilles you really should review them with your doctor and/or PT person. When I initially got to FWB I could only do the recumbent bike and the and the elliptical (with NO incline). When I tried using the rower I couldn’t use my surgery foot initially since it didn’t have the flexibility to bend as much as you do on a rower - so I did it 1 footed. Eventually as my PT exercises increased the flexibility of my achilles I would do the rower - but that took a while. You won’t help yourself if you cause things to stretch or break or tear. You can certainly do many arm related exercises - but not if it involves standing on 2 feet. You will lose a LOT of your muscle mass in your surgery leg. That’s just the way it is. You’ll have to work REALLY hard to get it back and that is just the way it is. Your PT person will give you the exercises you need to do and initially it won’t be much! Follow-up 12/4/2017. I telephoned my Dr. today and explained that I knocked my foot. The two middle toes had pretty much gone numb and I could not move them. I also had a bad pain in my calf on the opposite side of here I had surgery. They removed my cast…whew….about an hour of relief, but also one of pain. I can’t really stand the cast but it without a doubt protects my surgical area. It was swollen, stunk pretty bad. They removed the tape over where the stitches once were. The gave me an ultrasound on my leg and calf to make sure there were no blood clots. Then I FINALLY got to clean my leg…and a new cast (that was much thinner, more padding, and placed around the areas that were bugging me carefully) was put on. It is altogether much more comfortable. I think my leg shrinking in the other one left a lot of room for movement and created a lot of pain The new cast is great! It comes off on 12/13/17 - 9 days, then I am in my vaco. The Dr. looked at the vaco and was not too impressed…he thinks it is too complex. It sounds like something I did once and since my achilles didn’t hurt I didn’t worry about it. Since you’re still in the cast it is unlikely you’ll hurt the achilles - the cast just won’t let your foot move that much I also stepped on my casted foot while falling while trying to use crutches. Needless to say I gave up on crutches at that point - LOL! After I did something similar to what you did I was MUCH more careful about making sure my leg was properly positioned for the knee scooter before I lowered it. bamf’s AchillesBlog is proudly powered by WordPress and WPDesigner..